I like sharing recipes with you all because let's face it, who doesn't love food? 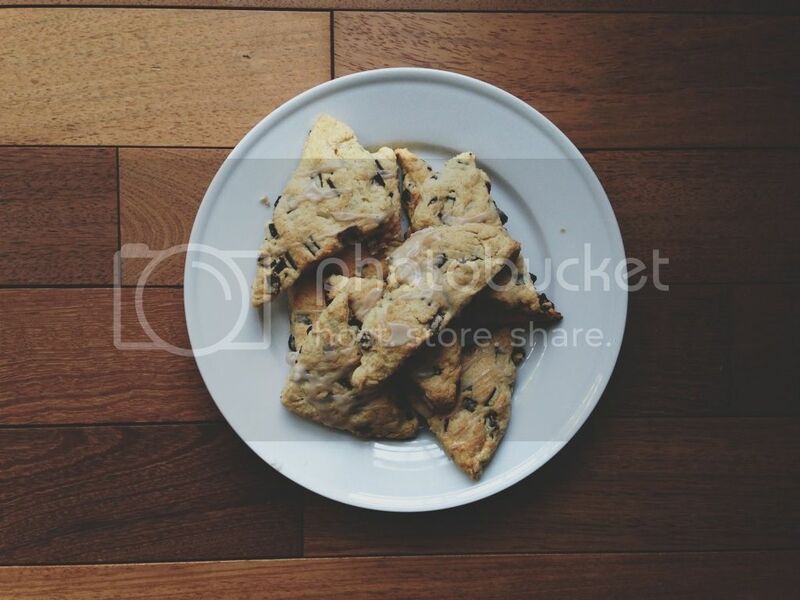 And chocolate chip scones? Um. So. Good. 2. Sift together the flour, baking powder, salt, and sugar. 3. Cut the butter into ½-inch cubes. Make sure it remains cold. 4. Add the butter to the dry ingredients. 5. Using a pastry cutter, two knives, or your hands, cut the butter into the flour. It’s okay if a few lumps remain. Work quickly so that the butter doesn't melt. 7. In a separate bowl, whisk together the half-and-half or cream, the egg, and vanilla. 8. Pour the wet ingredients into the dry ingredients. 9. Use a fork or wooden spoon to mix it until the dry ingredients are moistened and the dough barely holds together. DO NOT OVER-MIX. 10. Turn the dough onto a floured surface. Shape the dough into a 6-in x 9-in rectangle. 11. Cut the rectangle into six 3-inch squares. Cut each of the square diagonally so you get 12 triangles. 12. Place the scones onto a greased baking sheet and bake for 15-18 minutes, until golden. Let cool.